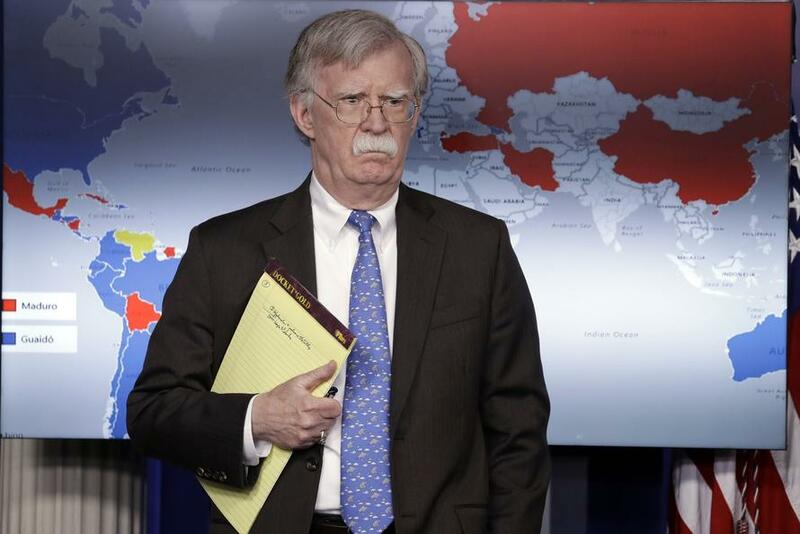 During a Monday White House press briefing national security adviser John Bolton was photographed carrying a notepad — presumably as he was fresh out of a national security meeting — and one of the things which appears to be handwritten on the pad is "5,000 troops to Colombia". Bolton during the White House presser revealed that President Trump is "leaving open the possibility of a U.S. military intervention to protect opposition leader Juan Guaidó, members of the nation's assembly and American diplomatic personnel," according to NBC. But could, as the notepad suggests, this involve plans to send 5,000 American troops to neighboring Colombia, a close US ally in Latin America? No doubt the administration is already spitballing military contingency operations especially after the latest spat over Maduro's ultimatum for all US diplomatic personnel to leave the country "within 72 hours" — which he has since walked back after the Trump administration threatened severe consequences.